If you are taking the Final Exam, your assignment is to watch this video to prepare. UPDATED FRIDAY AFTER CLASS: I decided that for homework instead of completing the entire assignment below that you just have to 1) pick a woman from the list 2) read her biography 3) take notes on her bio. I will check these notes in class on Tuesday. Choose one woman from the list (see categories). Read her story. Write a proposal (1 page typed) as to why she should receive one of the following awards. If you feel she should qualify for a different award or acknowledgement, you may choose another of your choice (include a link). Watch the following videos. Write a summary of each, quoting specific discussions and topics from each. Prove that you watched each video by included some surprising facts or details from each. 1) The speech is known as “I Have a Dream” but those words were never in the original draft, they were ad libbed on the day. 2) It lasts 17 minutes and is widely considered to have been drafted in New York and then in Washington in the hours before the rally. 3) As a result of the speech, Dr King was named Man of the Year by Time Magazine in 1963, and won the Nobel Peace Prize the following year. 4) Dr King drew his references from a wide variety of sources, including the Bible, the US Declaration of Independence and Shakespeare. 5) The speech was watched by more than 200,000 people assembled for the March on Washington, the largest march of the civil rights movement, as well as millions on television. Two men emerged as the leaders of two distinctly different kinds of Civil Rights movements. Dr. Martin Luther King, Jr. emerged as the leader of the mainstream Civil Rights movement, while Malcolm X represented a more radical movement known as the Black Muslims. These two men represented two very different ideologies and methods for accomplishing their goals. In this assignment you will analyze their written words/speeches. You will write a historical analysis answering the following Essential Question: Contrast the approaches to freedom and equality that MLK and Malcolm X took. State which side you believe is the more effective approach. Be sure to give specific quotes from each side to support your conclusion. Document: include which two primary sources you are using by including these in your first paragraph. "Two documents, ____ and ____, provide a clear illustration of the different approaches each leader took in achieving civil rights." Grading out of 100 points. - Choose a song from the link below. Listen to your song (recommend using Youtube). Read the lyrics to your song. - Write a two paragraph analysis of the song. 1. 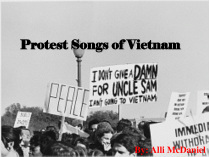 Explain how this song is considered a Vietnam Protest Song. What is the message of the song? In what context was it created? What was happening the year this song was written (this requires some research)? Was this band known for social consciousness? 2. Include at least 2 lines from the song to back up what you say. Analyze these lines. 3. Play the song for the class and explain the analysis. - Your homework should be around 2 pages in length in your notebook and each video should have 3-5 sentences. Click on the first link below. Choose a video to watch from the VIDEO BIOS section. Watch your video. Write a summary of the person's experience. Why do you think the History Channel chose to document their particular experience?